Finding IMAX Movie Theaters in the Southeast U.S. Visiting IMAX Movie Theaters in the Southeast U.S. Many of the IMAX Theaters in the Southeast are located in museums and science centers or in popular shopping malls and entertainment areas. These convenient locations make it easy to combine visiting popular vacation attractions with seeing an exciting IMAX movie. Designed to draw the viewer into the movie experience, IMAX movies offer great family fun anytime and are especially handy for the times you may need to take a break from excessive walking, too much sun, or inclement weather. Alabama, Georgia, Kentucky, North Carolina, South Carolina, Tennessee, and Virginia all have multiple IMAX locations across the states, and educational places like Discovery Place in Charlotte, Fernbank Museum in Atlanta, and the Louisville Science Center all feature science-based films on these larger-than-life screens. Read on to discover more exciting places you can catch an IMAX movie, organized by state. Although many might not think to vacation in Alabama, this great southern state hosts a slew of family activities, attractions, and parks throughout the year. From the Gulf Coast Exploreum in Mobile to the McWane Science Center in Birmingham, Alabama is actually known for its science museums and discovery zones. If you're visiting Birmingham with the family, you might consider checking out the McWane Science Center Imax Dome Theater, which is open seven days a week and features exciting IMAX movies at the five-story-tall theater. Other activities at the McWane Science Center include hands-on and interactive science exhibits, aquariums and more. Alternatively, you might want to visit the United States Space and Rocket Center in Huntsville, which features an IMAX theater, Space Camp, Aviation Challenge, and a NASA Visitor Center where children and adults can enjoy space-simulation rides, a rocket and shuttle park, and a first-class space museum. For the aquatic wildlife lover, Mobile's Gulf Coast Exploreum Science Center offers six permanent attractions including a domed IMAX Theater, a chemistry lab, and a 3-D virtual theater that immerses audience members in ocean life. Whether you're touring Augusta or taking a stroll through the Mall of Georgia in Buford, you're never that far from high-quality entertainment on a super-sized screen when visiting the Peach State. If you and your kids are in the mood for some history and science, a visit to Atlanta's Fernbank Museum, which features the world's largest dinosaur, will satisfy all of your cravings. While there, check out the Rankin M. Smith, Sr. IMAX Theater and catch one of their daily dinosaur experiences. If you're over in Columbus instead, the National Infantry Museum and Soldier Center also offers an Imax Theatre. There are also a number of IMAX theaters across the state in smaller towns separate from museums and learning centers. Places like the AMC Barrett Commons 24 in Kennesaw and the AMC Southlake Pavilion 24 in Morrow, for instance, both offer IMAX screens while the Regal Exchange Stadium 20 and IMAX in the Augusta Exchange Shopping Center offers a great place to spend the day shopping, dining, and catching a movie. Speaking of shopping—if you're a fan of shopping until you drop, you don't want to miss the Mall Of Georgia, an expansive shopping center in Buford whose IMAX 3-D theater is on the third floor. Kentucky doesn't have quite as many IMAX locations as other states, but the three that it does have are great not only for a quiet afternoon of entertainment but for their proximity to other great vacation spots in the state. The Kentucky Science Center, for instance, is located in downtown Louisville and hosts over 500,000 visitors annually. This huge, hands-on science center allows visitors to interact with over 150 displays and multiple learning areas, and, if you get tired of all the moving around and interacting, you can catch an educational feature on the center's four-story IMAX theater. On the other side of town, you can also check out the Stonybrook 20, which also features one of these huge screens. If you're out on the waterfront in Newport, but get rained out of your outdoor adventures, you can also check out the ​AMC Newport on the Levee 20,​ which offers an IMAX screen inside the Gallery Building. North Carolina also only offers two major IMAX locations, but that might be because there are so many other things to do in the state. However, if you find yourself in the mood for a great movie experience, consider checking out one of these IMAX theaters. In Charlotte, you can spend the day with your kids at the popular Discovery Place, a museum, aquarium, and learning center that features the Charlotte Observer IMAX Dome Theatre, where you can catch an IMAX experience between checking out the center's collection of interactive displays. In Raleigh, you can also visit the Marbles Kids Museum, which was created to inspire imagination, discovery, and learning through hands-on adventures and the museum's larger-than-life Marbles IMAX theater experience. Tennessee, though landlocked, offers not only beautiful sweeping vistas but plenty of places to escape the outdoors for a few hours of high-quality cinematic entertainment. In Chattanooga, you can spend the day with your kids at the Tennessee Aquarium before catching a movie at the IMAX 3D Theater right next door. Facing the Tennessee River, this huge screen shows a whole slew of exciting movies in 3-D, so you and your children will have plenty to choose from on your visit to the city. For a fun day in Knoxville, consider visiting the Colonial Pinnacle Turkey Creek Lifestyle Center, a popular mixed-use commercial and shopping development on the west side of the city which also features the Regal Pinnacle Stadium 18 and IMAX theater for all your film entertainment needs. In Memphis, your kids might enjoy one of the city's biggest attractions, the Crew Training International IMAX Theater at the​ Pink Palace Museum and Sharpe Planetarium complex. First opened in 1995, this facility center has become a focal point of Memphis tourism, offering days worth of fun for the whole family. From stand-alone movie complexes to museums and educational centers, the state of Virginia is ripe with IMAX theater locations, so no matter where you are in the state, you can always be sure to find a place to experience larger-than-life screens, thrills, and fun. Near Old Town Alexandria and the nation's capital, the AMC Hoffman Center 22 offers one of these giant screens, as does the AMC Tysons Corner 16 a few miles away in D.C.-area town of McLean. You can also check out the Regal Commonwealth Stadium 20 and IMAX in Midlothian, the AMC Lynnhaven 18 near the waterfront in Virginia Beach, and the AMC Potomac Mills 18 at the popular Potomac Mills Outlet Center in Woodbridge. If you're more in the mood for some educational exploration, you can also visit the Smithsonian's National Air and Space Museum Steven F. Udvar-Hazy Center in Chantilly, which features an IMAX Theater showing all sorts of space films. Alternatively, you can visit the Science Museum of Virginia in midtown Richmond and check out the IMAX DOME and Planetarium. Finally, for a fun-filled day with marine wildlife, visit the Virginia Beach Aquarium and 3D IMAX Theater. In addition to its more than 700,000 gallons of aquariums and live animal habitats, the Virginia Aquarium and Marine Science Center houses a 300-seat IMAX theater with a six-story-high screen. 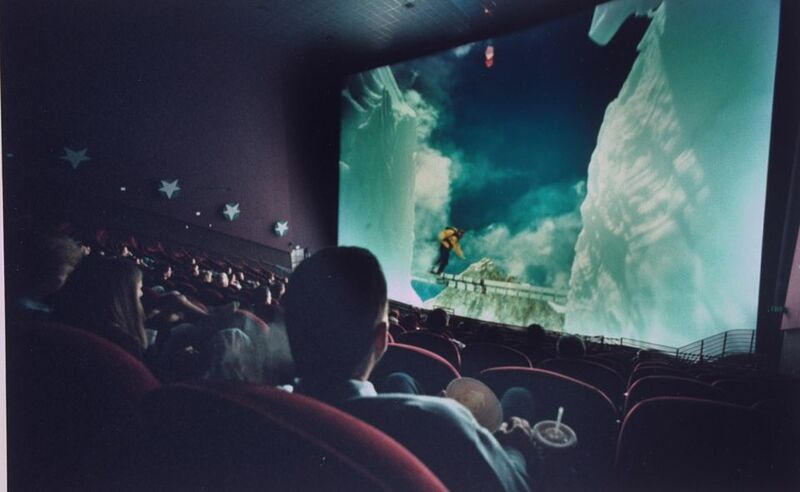 Where to Watch IMAX Movies in Washington, D.C.
Where Can I Find IMAX Movie Theaters in the Detroit Area? Alphabetized U.S. Water Parks that Begin with the Letter "B"